Are you a DIY-er? Do you watch all those DIY/home improvement shows and think, "I could do that?" Well, Aileen and Melinda are here to tell you it's not that easy. Feel free to learn from our experience. 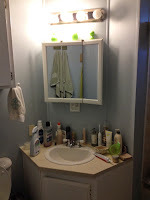 Aileen's: Since the bathtub in the main bath had cracked, I needed to replace the tub. The surround had me worried because of holes in the "tile" panels, so I was afraid of water damage. 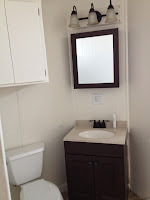 I also wanted a toilet that flushed well, and the vanity was ugly, so why not replace it, and redo the floor too, while I was at it, right? Melinda's: Remodel my daughter's bathroom, taking out wallpaper, the fit-for-2 tub and replacing it with a tub shower, as well as removing the 27" square shower (perfect size for pixies) and using that space for a 2nd bedroom closet. 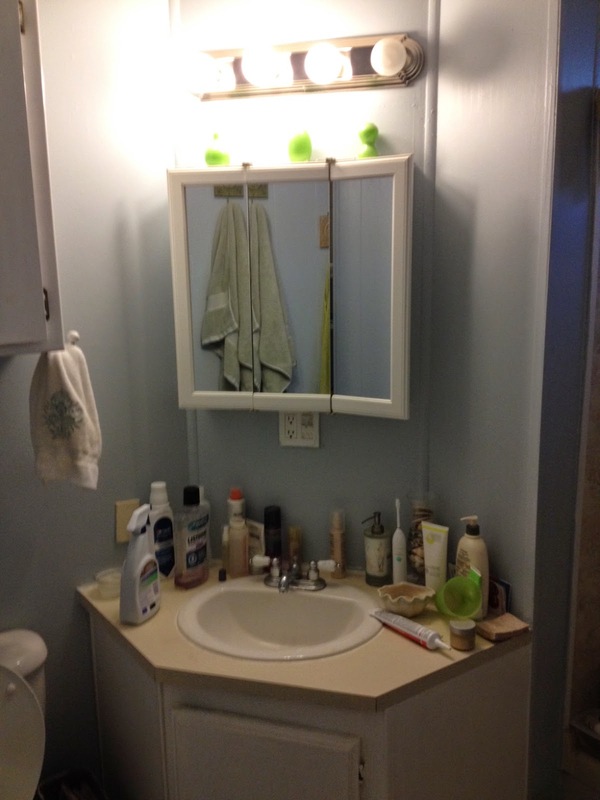 Also to be done were re-purposing the old vanity and "Mirror, mirror on the wall" medicine cabinet. Aileen:My budget was tight, and I knew I couldn't afford to pay for help. I recruited my older daughter and my younger daughter's husband to help with the heavier demolition and to get the new tub in place, as I knew what I could carry on my own. What I didn't anticipate is the state of mobile home plumbing. If I were to do it again I'd hire a plumber. 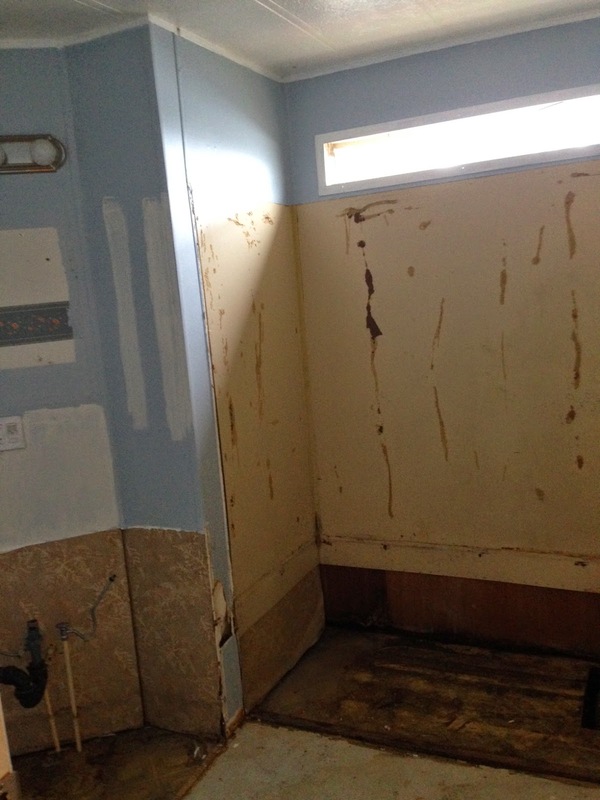 Melinda: Call us wimpy, but we called a plumber to take out the tub, shower, and lay new flooring. Mr. Curtis knows his limits and they edge right up to water pipes. 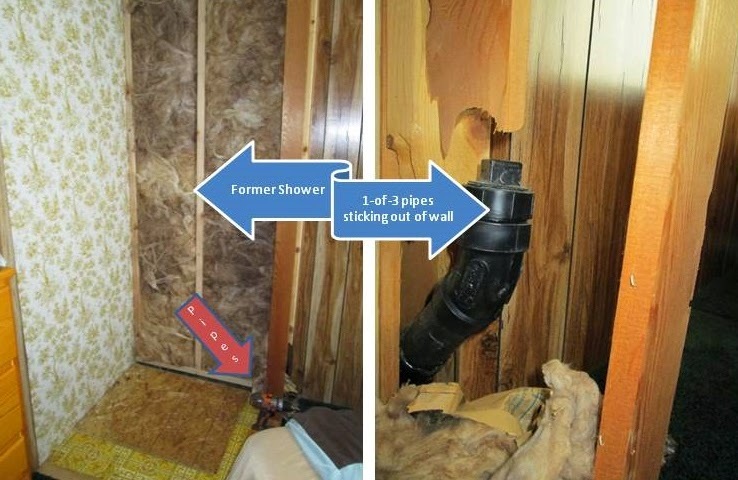 Unfortunately, we didn't supervise this process and arrived to find several pipes from the shower - including hot/cold water shut-off valves - sticking out of the floor and wall. After multiple discussions late Friday night (which included brainstorming work-arounds like built-in shelving and awkward closet placement), we got brave and called the plumber who agreed to return to make things right gratis (yes, for free!). Lesson learned: be clear with the help about the dimensions and placement of closets. Aileen: I was a good Mom and bought leather gloves, safety glasses and face masks beforehand. That doesn't mean I remember to use them. In an ironic twist, while doing the demo, my daughter and I did a "demo" of why gloves are important. We both managed to catch part of our hands between the hammer and pry bar. Mine was with no gloves, hers was with gloves on. This, children, is why we wear safety apparatus when working with tools. 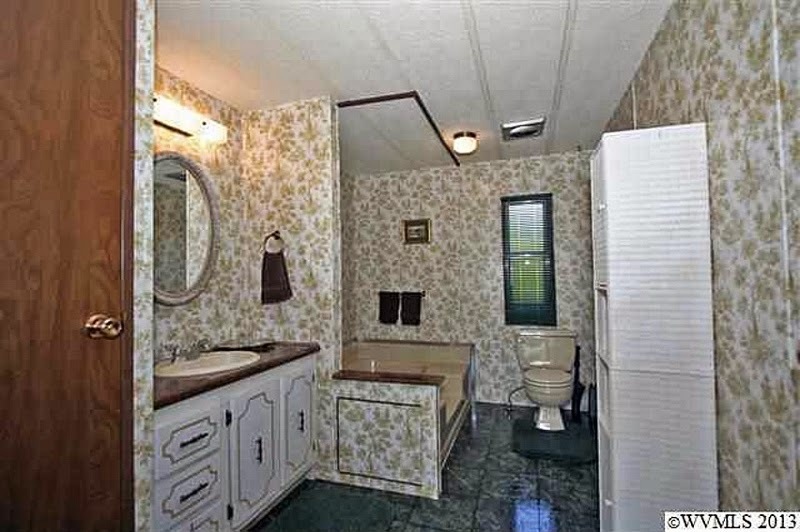 Melinda: We hadn't realized that wallpaper in mobile homes is part of the wallboard. When we started to paint, every fixture hole and staple holding the wall in place showed. I was devastated. Mr. Curtis was in his element, having grown up doing wall finishes. At 9 p.m. he produced a spray rig, hopper and drywall mud. The bathroom was textured by morning and ready to paint the next night. Meanwhile, I was busy painting the vanity and mirror a chocolaty brown. 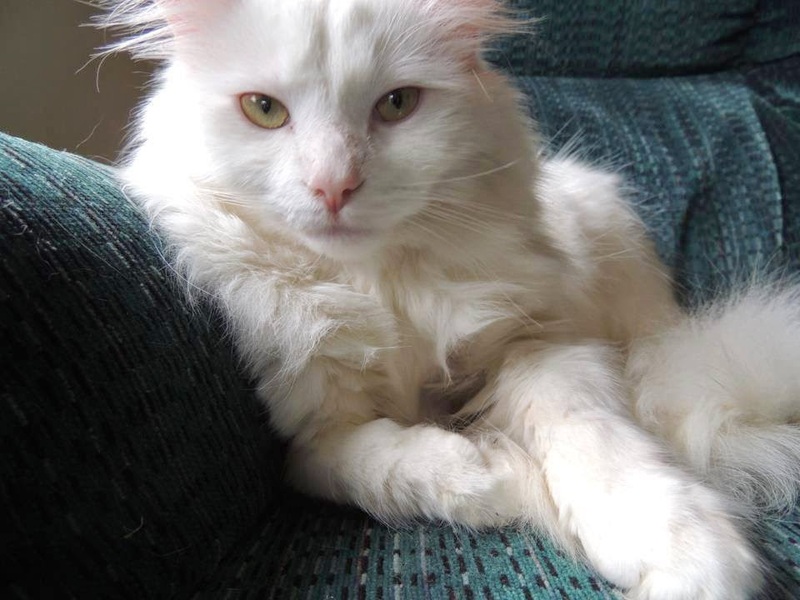 Between coats, my daughter's 18-pound cat rubbed against all surfaces, which required repainting. Lesson learned: know the materials you're working with and shut out the cat! So what do you think? Are you up for a DIY project? If so, what would you tackle? When she isn¹t imitating a home renovation expert, Aileen Fish is busy at work on the next book in her Small Town Sweethearts series. When not wielding a paintbrush, Melinda Curtis is busy at work on her sweet Harmony Valley romance series. What a fab post! I am so not a DIY-er but it doesn't mean to say I haven't done it, and have the badly wallpapered walls to show for it. (Such nice paper, too.) I used to love watching DIY shows but it's such a con - they show you how easy it is - "if" you have the tools. I think those tools are the most expensive part! Although, I borrow my daughter's drill because it's almost three times more powerful than mine and now I have tool envy. Both of your projects turned out beautifully, and it's a great feeling of accomplishment to be finished, but DIY is never easy, is it? I do this kind of thing all the time and have the scars to prove it. We won't even discuss my three sons who are all in some branch of the construction and/or remodeling business. I'm convinced they moved out of state to get away from me and my projects. The worst job ever was scraping off the sprayed-on popcorn ceilings (I want to meet the guy who invented that nasty stuff!! ), plastering and painting them. But as my sweet sister, Betty, keeps reminding me, 'You only have to do it once." Patty, Mr. Curtis sees popcorn ceilings and immediately makes plans to remove them. He's tried convincing my mom to do it for years, but she's only let him remodel her bathroom and put in new light fixtures. Go figure. This is the first time I dragged my kids into a project, because I knew there was no way I could do parts of it alone. But seeing what my son-in-law went through with the plumbing for the tub, I won't ask him again. Aw, come on, Aileen. What's the use of having a son-in-law with skills if you don't capitalize on it every once in awhile. My daughter's dating an engineering major who has tool envy for Mr. Curtis' tool box. If things work out, I'll have 2 Mr. Fix-Its in the family. Great job. 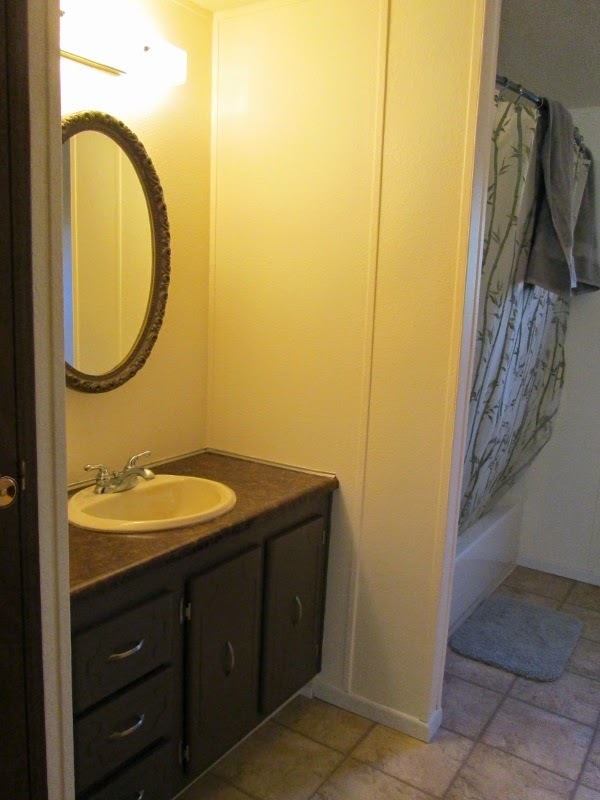 I've pulled out sinks, but I haven't been brave enough to try the tub—I have enough trouble with changing the knobs. What a great post. I love not only how great the after pictures look and the blow by blow account (sorry Aileen - could not resist a bad pun!) but also how your families pulled together to help pull it off!